Hey gang...Travis back with some REALLY cool Tampa Bay entertainment news! 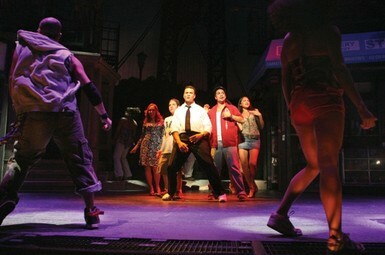 This just in from TBO.com...The Broadway hit "In the Heights" has won a slew of awards for chasing down and delivering the American dream to theatergoers. Now fresh from Broadway, the show&apos;s national tour begins Tuesday in Tampa at the Performing Arts Center. The title refers to New York&apos;s Washington Heights neighborhood, a barrio teeming with family-owned businesses built by Hispanic immigrants and their children. Central to the story are the owners of a taxi service, who struggled to put their daughter through college — the first in her family to go. Another family owns a beauty salon and a third runs a bodega. Everyone aspires to something better, and they all know it&apos;s possible in America. The multigenerational story is relevant to both Miranda, who grew up in Washington Heights, and to author/playwright Hudes, whose Puerto Rican parents settled in Philadelphia. Miranda wrote a first draft of "Heights" in 1999 during his sophomore year at Wesleyan University. He based the characters and storyline on personal experiences and observations. Through the next several years, the work developed into a series of successful stagings. Eventually, Miranda and Hudes met and collaborated to fine-tune the production that reached off-Broadway and then Broadway in 2008. While he focused on the music and lyrics, Hudes fleshed out the story and dialogue. HOW MUCH: $38.50 to $72.50; just call (813) 229-7827 or visit www.tbpac.org. If you want to read more of this story, including quotes from the cast and writer, click here! And as always, keep checking back for more great things to do in Tampa Bay, and other Tampa Bay area events!